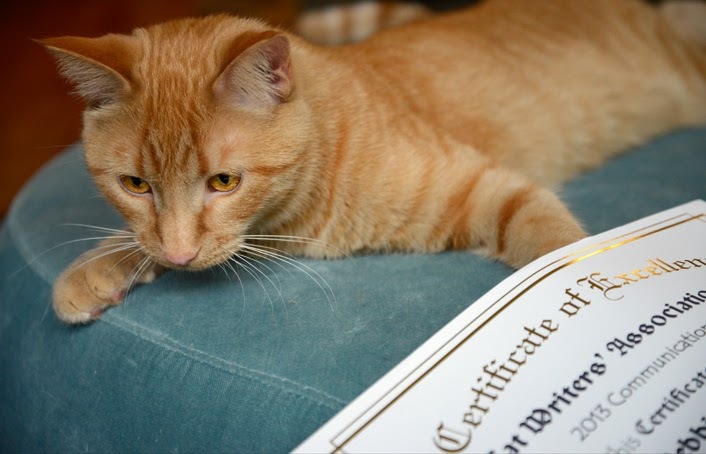 Glogirly recently had the honor of receiving three Certificates of Excellence from the Cat Writers' Association. She's only been a member of the CWA for a little over a year now and these are her very first awards. 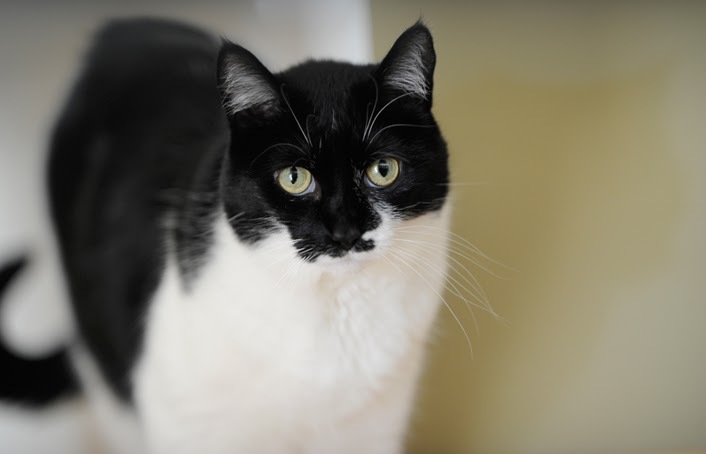 For those of you that haven't heard of the CWA, it's a journalism organization founded to encourage professionalism among cat writers, photographers, artists and broadcasters. 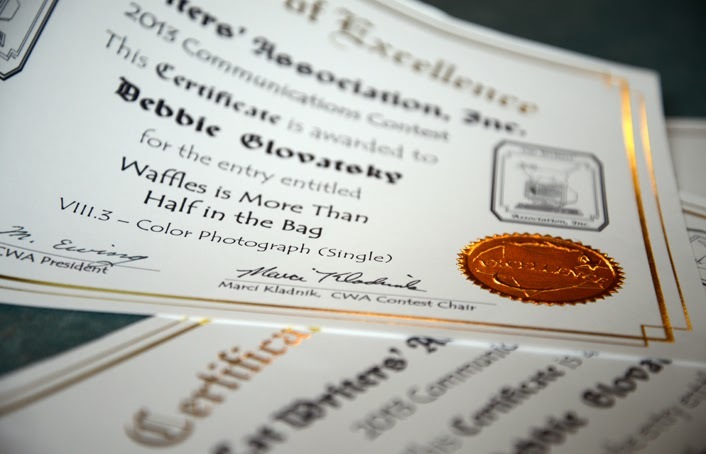 Each of her certificates are for excellence in photography. Clearly the the judges were impaired though...given one of her winning photos, 'Waffles is More Than Half in the Bag,' features the orange terrorist. Sure hope he doesn't get his sticky paws all over her pretty awards. He's worse than Gloman after a bag of Cheetos. This year's CWA conference is coming up soon. Halloween to be exact. Not only is Glogirly attending the conference, she'll be teaching a session on photography! I've already started helping her prepare her presentation slides. Oh that just sounds so exciting! Concatulations! How exciting for Glogirly but erm Katie? You got a bit of the beached whale look about you there. Are you sure the diet worked? Those are some old photos of me, Patty. Don't worry....I'm down about 2 pounds since that beached-whale-look. The CWA is wonderful group. You forgot to mention you're doing the presentation with me. And we both won Muse Medallions. Please tell me she is taking you and waffles with her to teach the class. She could get all her students to photograph you two - that would be brilliant, I would sign up for that! Concatulations!!! Katie, you don't look like a beached whale!!! You're gorgeous!!! It sounds like another fun trip fur Glogirly! Will the sitter referee you & the orange terrorist?!? ConCatulations on winning the CWA award! Concatulations on the awards! We hope it's a good meeting on Halloween... what a fun date for a conference. The head peep really wants to learn more about the CWA. We need to remind her to talk to one of you members about it. Congratulations! You always have such nice lighting in your photographs. The pictures of air Waffles are awesome. I'd sure like to go to your seminar. Congrats!!! And we bet her class will be great. Congrats to Glogirly! That is quite an honor. Our mom wanted to join CWA, but we don't think they allow you to join for blog writing anymore (our mom is a freelance writer, but doesn't submit to magazines; all her work is on-line). We hope Glogirly has a nice time at the conference. It must feel really good that they want her to teach a session!! CONCATS to Glogirly! Mommy envies the light in your condo...nice and soft. How awesome is that! Absolutely terrific and well deserved! Whoa! Concats to Glogirly! 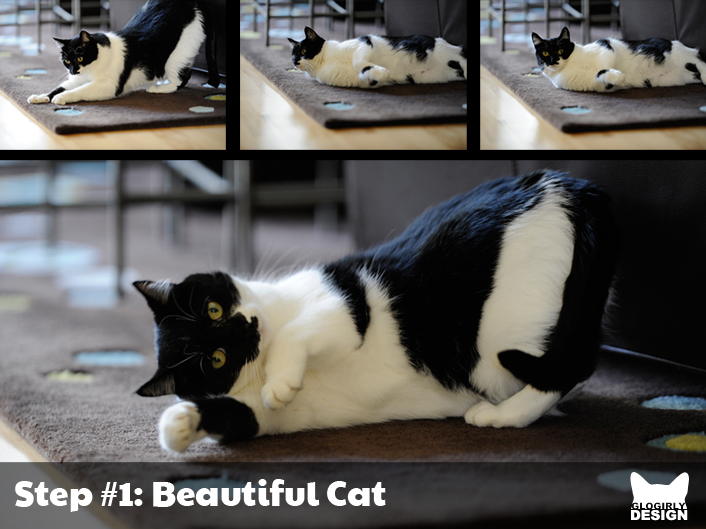 She must remember in her course that not everybody has such photogenic cats such as you and me to work with. How does one join the CWA? I'm a cat and I write. Do I need other qualifications? It does help to have such gorgeous subjects! Concatulations to GloGirly on her awards! Have fun at the conference!!!! Congrats. I always love your photos. Concatulations, GloGirly! Your photos really are fabulous. And no, Katie, you do NOT look like a beached whale! You look plush. And very clean. Oohhhh... congratulations are in order for sure. Congrats, Glogirly! Katie, you're doing a great job helping her prepare her slides. She'll be ready in no time. Well isn't she something else. Don't you think you should have won? Congrats Glogirly, you are rockin' it! That is the most delightful news!! We are so proud of GG!!!! Nice job! Congrats from me and Crepes! - Alana. BIG ConCAtulations to the Certificates ! I think that Glogirly´s teaching session will be e huge succés ! Looking forward to seeing you at CWA conference. Our first time attending as well. Would love to take your photography class. FaRADaY: I WOULD NOT! We don't wanna see it anyways. It'd only make Allie more insufferable, since it was HER photo. So THERE. Congratulations! I sure wish I could attend your class on photography. If I had to actualy buy film and then pay for pictures, there would be no photos at all on my blog. Most go in the trash, but I am still trying.